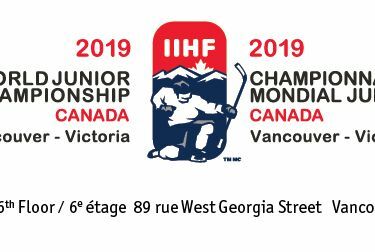 The 2019 IIHF World Junior Championship is starting this December in Vancouver and Victoria, BC and the organizers are working to engage local partners and businesses in advance of the event. Together with the Host Organizing Committee and Hockey Canada, they are actively working towards delivering a world class event that will once again showcase BC to the world. An essential part of this once in a lifetime event is the legacy that it leaves behind. All profits from the event will go back into the community through minor hockey programming and youth initiatives. Dress up the Town. The organizers are encouraging the communities to showcase pride in hosting this event by sharing event messaging through e-cards, posters, banners, or contesting. Please let the organizers know and they will work with the World Junior Championship team to collaborate on sharing this message. Full Event Packages are still on sale but are going fast. Limited Full Event Packages can be purchased at www.hockeycanada.ca/tickets. Based on sales to date, tickets will be in short supply come December. Let’s fill the buildings!